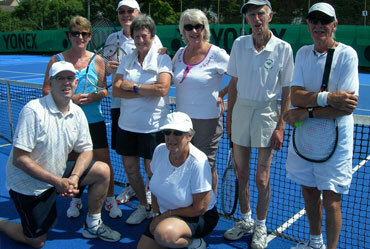 Bicester Tennis Club runs one of the biggest, friendliest and most active Veteran tennis groups in Oxfordshire. We have over 25 men and women Veterans in the club and many of us play at our afternoon doubles sessions which are Tuesdays and Thursdays between 1pm and 3.30pm. The age range is approximately 40's to 85 years of age. If you are a tennis player and free in the afternoons, please come along and join in with us. You will be given a warm welcome and can try as a guest to see if you like it, before joining the club. In addition the club runs veteran tournaments and events specifically for our veteran members. Membership for tennis veterans at Bicester is at a reduced annual subscription of £69 for unlimited play all year round. The reduced rate applies from age 60. Any enquiries about Veterans tennis, please contact our veterans' representative, Pam Newall.